Robert Whittaker is the best Australian mixed martial artist of all time, a former SFA Welterweight champion, and current UFC Middleweight champion. Robert Whittaker is currently 28 years old according to his date of birth December 20, 1990. Robert Whittaker knows to deliver a fatal blow from any position. His strongest strikes are right cross, right front kick, and counter hook. As a fighter with Karate background, he tries to keep the fight standing as long as possible. His counterstrikes are especially dangerous, and he is also a master of throws. He is the most explosive fighter in Middleweight division. When the fight is taken to the ground, Robert Whittaker attacks like a machine. He can deliver 20 or even 30 hits in less than 10 seconds! The Reaper has a black belt in Hapkido, a black belt in Goju-Ryu Karate, and a brown belt in Brazilian jiu-jitsu. Whittaker is known for great submission defense. Whittaker knows to defend takedowns like a pro. His trademark is right knee to the head off the clinch when the opponent is pressed against the fence. His fighting style confuses the opponents since he is the only fighter who does a fight uppercut, left hook, and right high kick in a single combo. Robert Whittaker currently holds one of the longest winning streaks in UFC – 8 victories in a row. He is undefeated from June 28, 2014, and he doesn’t have a defeat or draw in Middleweight division. Robert Whittaker had his MMA debut versus Chris Tallowin at XFC 14 on March 14, 2009, and won that fight via TKO (punches). He joined UFC with the score of 9-2. Robert Whittaker had his UFC debut at UFC On FX 6, on December 15, 2012, where he defeated Brad Scott via unanimous decision after three rounds of fighting. His second opponent was Colton Smith at UFC 160, on May 25, 2013. The Reaper won via third-round TKO. Whittaker faced Court McGee at UFC Fight Night 27 on August 28, 2013. Despite he started the fight well, the last two rounds were won by McGee, and Bobby Knuckles is defeated via split decision. Whittaker was removed from the fight card at UFC Fight Night 33 since his opponent, Brian Melancon, had to withdraw due to an injury. 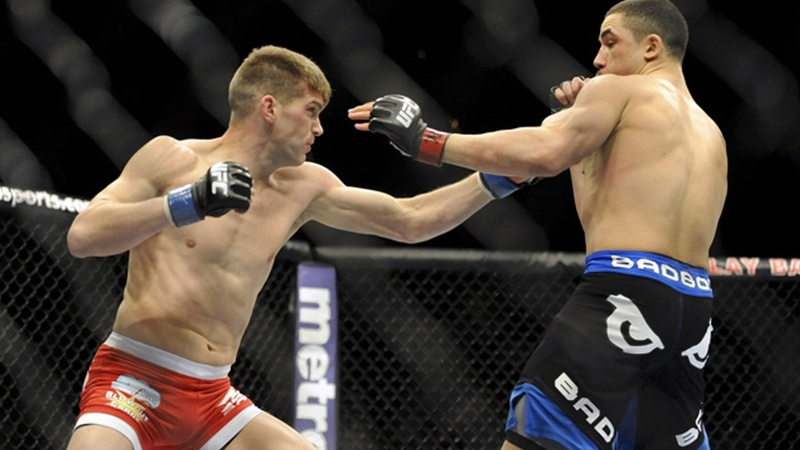 Stephen Thompson defeated Robert Whittaker at UFC 170 on February 22, 2014, via stunning TKO in the first-round. The Reaper simply couldn’t recover after a tremendous right cross. His last Welterweight fight was against Mike Rhodes at UFC Fight Night 43 on June 28, 2014. Whittaker earned a big victory via unanimous decision in his city of birth. After this fight, he decided to go one division up. Whittaker defeated Clint Hester at UFC Fight Night 55 on November 8, 2014, via TKO in the second round. He received his first Fight Of The Night bonus. His next rival was Brad Tavares at UFC Fight Night 65 on May 10, 2015. The Reaper won via spectacular KO in the first round, earning his first Performance Of The Night award. Robert Whittaker should fight Michael Bisping at UFC 193 on November 15, 2015, but The Count pulled back due to an injury, and he is replaced by Uriah Hall. Whittaker won the showdown via unanimous decision. Rafael Natal was a very tough opponent at UFC 197 on April 23, 2016, but Bobby Knuckles earned one more unanimous decision victory. His next rival was Derek Brunson at UFC Fight Night 101 on November 27, 2016. 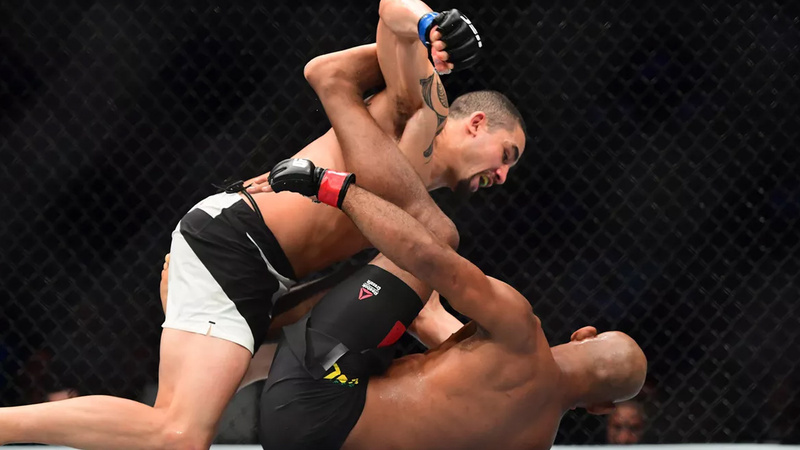 This time, Whittaker was more than convincing and landed a brutal right high kick in the first round, winning the fight via KO, earning his second Performance Of The Night and Fight Of The Night award. It was his first fight in the main event of the evening. You can say The Reaper made a big surprise at UFC On Fox 24 on April 15, 2017, when he finished Ronaldo Souza via head kick in the second round. He became the first man to finish Souza since 2008, earning his third Performance Of The Night award. Michael Bisping didn’t get the chance to defend the title because Georges St-Pierre canceled the fight with him at UFC 213, claiming he needs more time to prepare, and he is not ready to fight until November. 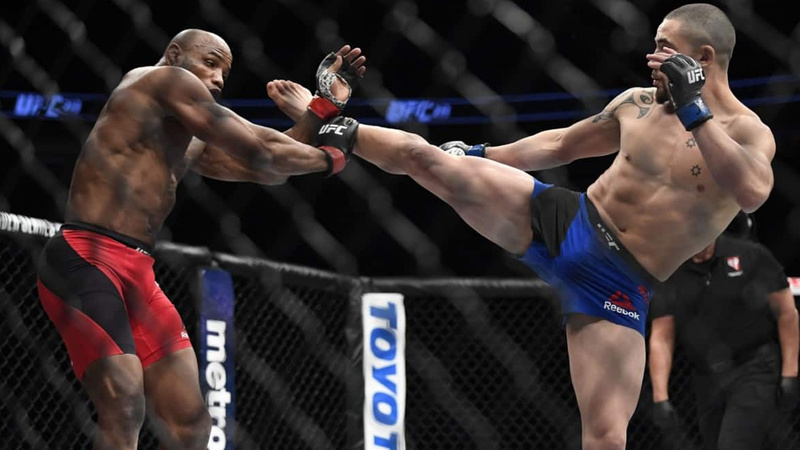 UFC had a UFC 213 fight as a part of Bisping’s contract, so Whittaker got a chance to fight for the Interim title against the Cuban superstar Yoel Romero at UFC 213, on July 8, 2017. In a very tactical and cautious fight, Robert Whittaker won via unanimous decision, becoming the first Australian and New Zealand born fighter to become the UFC champion. The Reaper hurt the medial side of the knee on his left leg, so he was unable to fight for the rest of 2017. It is classified as grade two medial ligament injury. Whittaker has already strained left leg in the training four weeks earlier, and Romero kicked him aggressively to that leg early in the first round. But despite Robert Whittaker had no stability at that leg at all, he didn’t withdraw nor let Romero execute his superior wrestling. What a Spartan! Georges St-Pierre vacated UFC Middleweight title on December 7, 2017, due to his health issues, and Whittaker was promoted to the undisputed champion. He was slated for the title defense versus Luke Rockhold at UFC 221, but he had to withdraw, as he cited, due to an undisclosed injury. 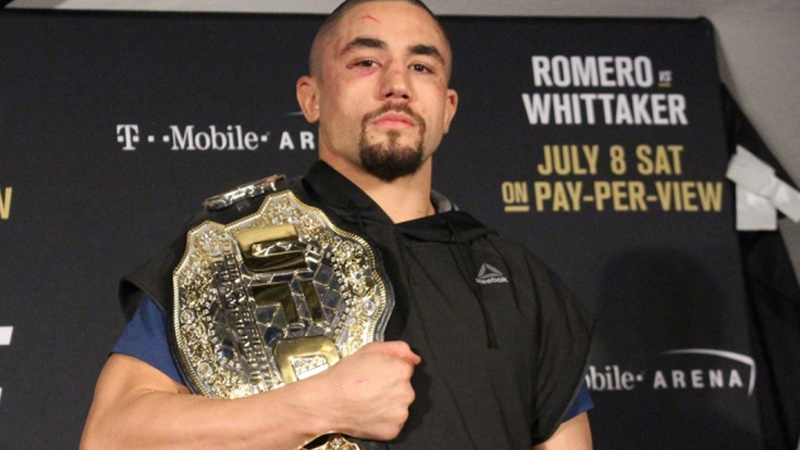 Whittaker was devastated since title defense should have been on his home soil. Dana White announced that Robert Whittaker has a serious staph infection in his stomach on January 20, 2018. Whittaker opened up a bit more about his problem, claiming that he likes to fight injured, but he couldn’t get medical approval. The Reaper is scheduled to face Yoel Romero in a rematch at the main event of UFC 225 on June 9, 2018. Whittaker has already claimed he won’t fight Romero if he misses weight. The Reaper competes in amateur wrestling since 2015 for the national team of Australia. He has qualified to fight for Australia at the 2018 Commonwealth Games. Whittaker does this for love and he confirmed that he wants to compete at this event if his UFC obligations allow him. Robert Whittaker is married to Sofia Whittaker since 2014. The couple has three children – John, Jack, and Lilliana.